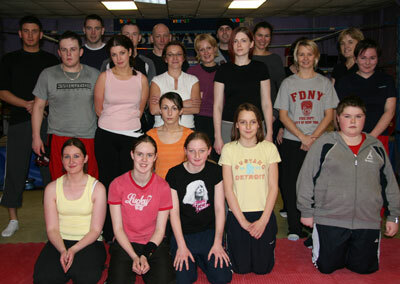 ProKick Kickboxing Gym launched its second Get Fit campaign in 2008 – a six-week course that will get newcomers in shape and stir some life into couch potatoes who have got a little lazy through the festive season. The next course kicks off at 7pm Friday 29th February at the ProKick HQ in east Belfast and will work through the fundamentals of fitness, elements of self defence and come up with a diet for those serious about getting in shape. Murray himself is testament to the benefits of the ProKick regime. At 47-years-old, the former world champion made a ring comeback in 2005 and won in triumphant style in the Ulster Hall. His final bout was a fund-raiser for cancer charities. There is also a special incentive for those who sign up to the course. The first 25 people who join will be entered into a draw to receive a one-to-one coaching course from Murray himself. The winner will also be kitted out in complete ProKick gear – including kickboxing uniform, pads, gloves and headgear – in a package worth £500. 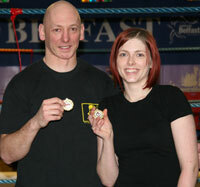 (L-R) Patrick Young and Kamaylah Jackson win Prokick Says competition in the first class. Judges couldn't split the pair, so awarded a draw.